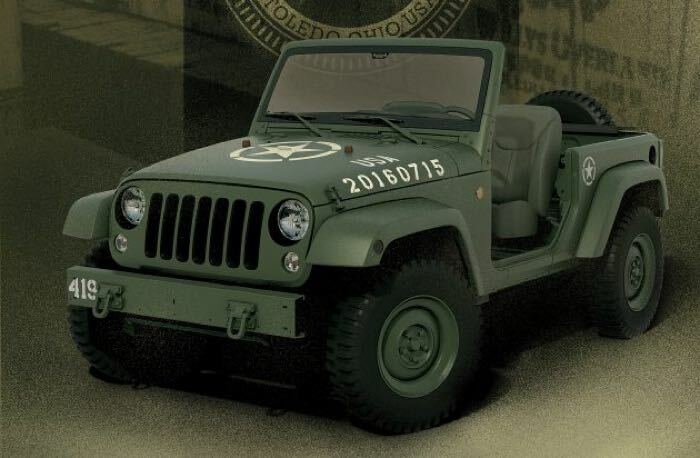 Jeep originally developed vehicles for the US military and the company is celebrating 75 years with the launch of a new Jeep Wrangler 75th Salute Concept Vehicle. The Jeep Wrangler 75th Salute Concept Vehicle is based on the Wrangler Sport and it comes with a 3.6 litre v6 engine with a six speed manual transmission. The “function over form” of the original Jeep military service vehicles is evident in this unique concept vehicle. The Wrangler 75th Salute concept – a modern interpretation of the Willys MB – is based on a two-door Wrangler Sport and highlights rugged functionality with heritage design cues, including the absence of B-pillars and doors. The exterior features an olive-drab color scheme that was first seen on military vehicles 75 years ago and is present throughout the Wrangler 75th Salute concept. You can find out more information about the Jeep Wrangler 75th Salute Concept Vehicle over at Jeep at the link below.